Albion's Elegance Face Powder A Poudre Haute Naunce launched a couple of months back, and I was pretty excited about this, because it's just so pretty, and also because this is officially my first Albion makeup product! Albion is a luxe Japanese brand, better known for its skincare, in particular its lotions, but it also has a line of makeup products. The Albion Elegance Face Powder is basically a pressed face powder with different coloured sections, much like the Guerlain Pressed Meteorites. 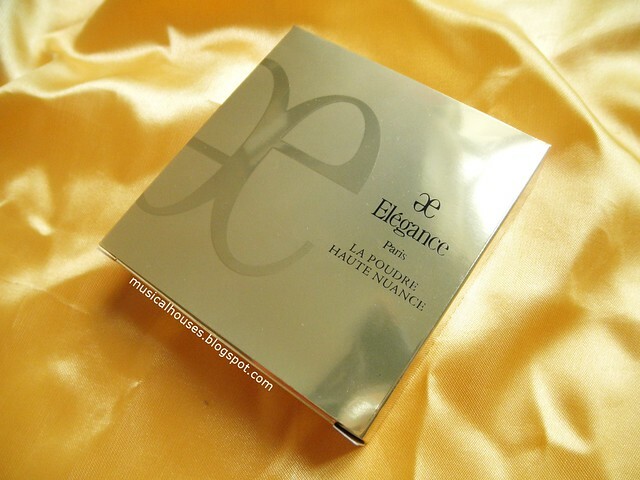 The Elegance Powder claims to help brigthen the skin, cover pores, and also last on the skin. 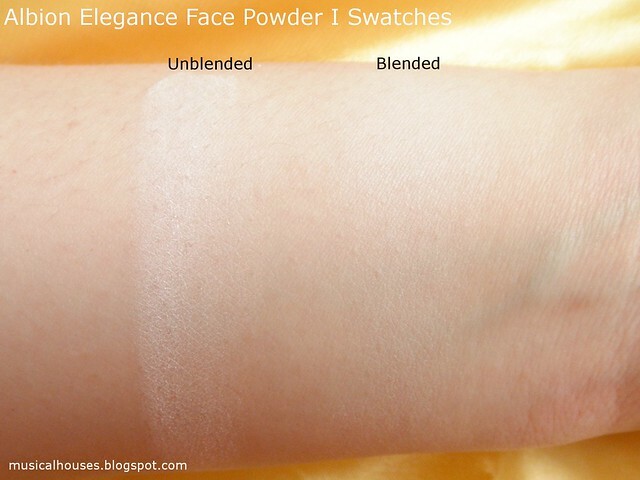 are three shades of Elegance Powders here: No. 1 (Elegance), No. 4 (Clear), No. 5 (Gorgeous), and No. 6 (Airy). The shade I have is No. 1. All the powders are pretty sheer, however, quite sheer (as we shall see in my swatches), so for the most part, there isn't too much of a great difference between shades to the untrained eye. 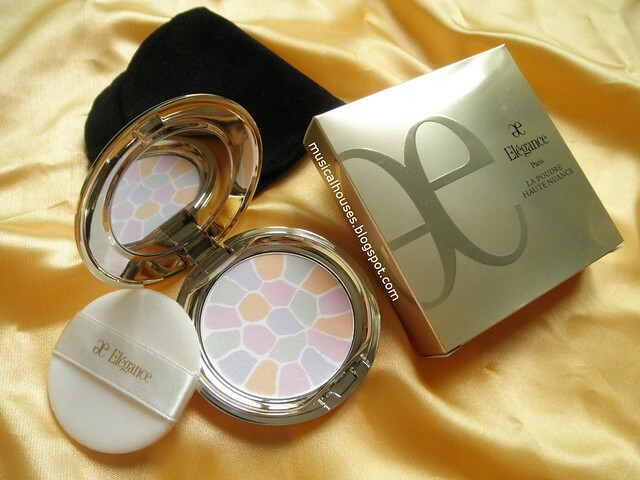 So without further ado, I'll be reviewing my Albion Elegance Face Powder in shade No. 1, and of course, with most reviews I'll start with the ingredients list! The ingredients in the product are powder fillers and oil absorbers (Talc, Nylon-12, Pearl Powder), anticaking agents (Aluminium Distearate), emollients (Squalane). There are also a variety of plant and silk-derived extracts (Hydrolyzed Silk PG-Propyl Methylsilanediol, Dipotassium Glycyrrhizinate, Althaea Officinalis Root Extract, Arnica Montana Flower Extract, Typha Angustifolia Spike Extract), which perform a variety of functions - some are emollients, some might potentially have anti-irritant properties, and so on. 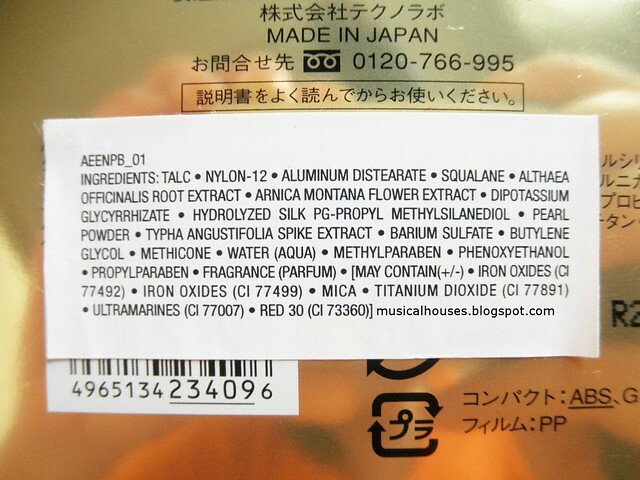 Lastly, there are also functional ingredients necessary to the product, such as opacifiers (Barium Sulfate), solvents (Butylene Glycol), silicones (Methicone), Water, preservatives (Methylparaben, Propylparaben, Phenoxyethanol), Fragrance, and the pigments that give the powder its colour and shimmer (Iron Oxides, Mica, Titaniu, Dioxide, Ultramarines). 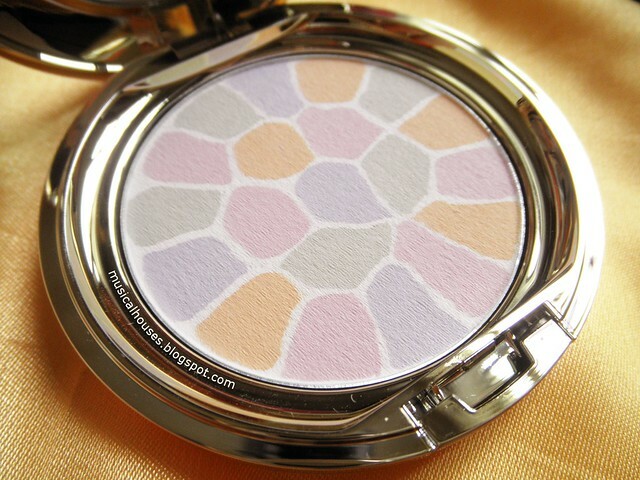 From a formulation perspective, we can see that this is pretty nice, as far as powders go. It's got some pretty high-end powders, including Nylon-12, which like talc, also functions as an oil absorber, and also adds a nice, smooth feel to the product. Nylon-12 is also able to expand and contract with facial movements and expressions, so it appears smooth on the skin and doesn't settle into facial lines. Also, there is the use of Pearl Powder, which is also a nice addition to a higher-end powder. Pearl Powder has long been used in traditional Chinese medicine as a "lighten pigmentation [and] slow down the aging process of skin". While there aren't many studies on pearl powder used topically in published scientific literature (thre were a grand total of 2 in PubMed), what was there was cautiously promising - there is some indication that "pearl extract could be useful for enhancing the wound healing of fibroblasts", and also that "pearl powder has a satisfactory moisturizing effect on skin", and also could "significantly reduce the activation of tyrosinase and free radicals". Lastly variety of plant and silk-derived extracts is also a very nice inclusion for a face powder, and will appeal to people who like more plant-derived ingredients in their cosmetics, and also helps to contribute to the more "luxe" factor of the product. So now that we've looked at the formulation of the Albion Elegance Powder, how does it perform? 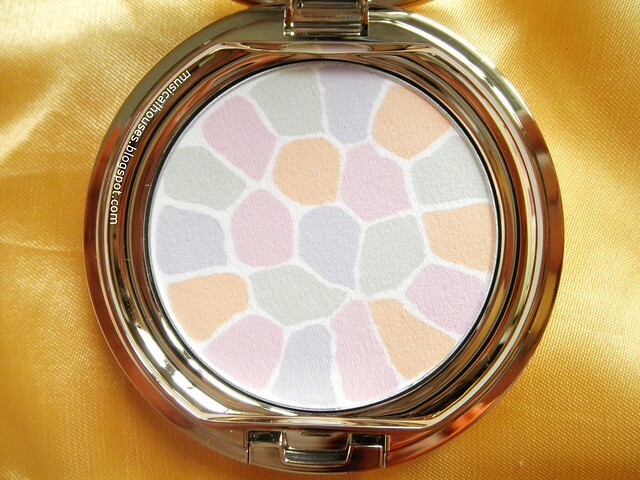 The powder itself is really pretty, and consists of various shades - pink, lilac, green, yellow, white - in one pan. You basically use this like you would any pressed face powder, and I just use a brush and swirl it all over the pan, and then apply to my face. I don't really use the included puff, although it could come in handy in a pinch. I use this both as a setting or finishing powder, and also for touch-ups. Above, you can see swatches of the powder. The powder is quite sheer, so there wasn't much point in swatching each individual colour in the pan, so I've opted to just swatch the entire blended powder together instead. The powder has a semi-matte finish, and there is some shimmer, but it's quite fine and sparse. 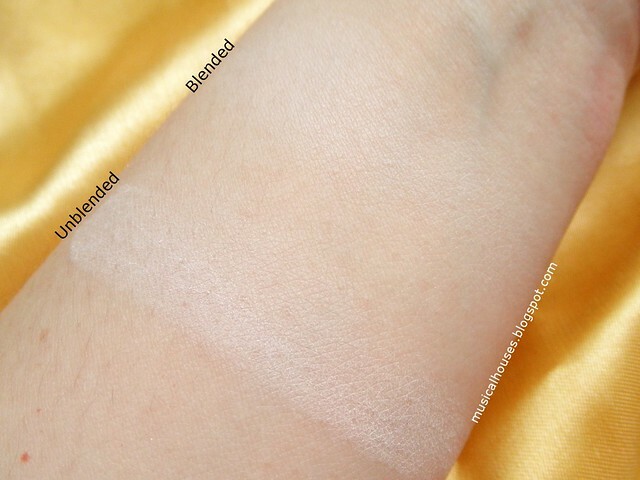 It also is quite pale, and on my NC20 skin basically swatches almost white when built up, so while it's sheer and can be blended out, I suspect ladies with deeper skintones might find this looks a bit ashy on them, and perhaps another shade of powder would work better. And above, you can see the swatches at an angle, to really demonstrate the semi-matte finish. It also has a floral scent, which is probably a hate-it-or-love-it thing, depending on how much you like scented makeup products. For me, I'm indifferent to the scent. 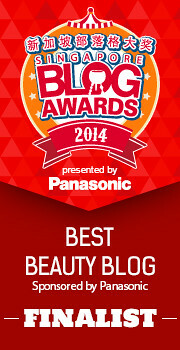 When I wore it, I found that it was pretty useful as a setting powder, or as a face powder. It has a texture that is very nice and smooth, had a decent wear time, and looks pretty natural on skin when blended out. Visually, I felt like it probably sort of made my makeup look better overall, although the effect was definitely much more subtle than dramatic - you can't really tell that anything different has been done to my makeup. The compact was also quite travel-friendly, and despite being all gold and posh-looking, it's actually quite light and not heavy at all, so it's not going to weigh down your travel purse. 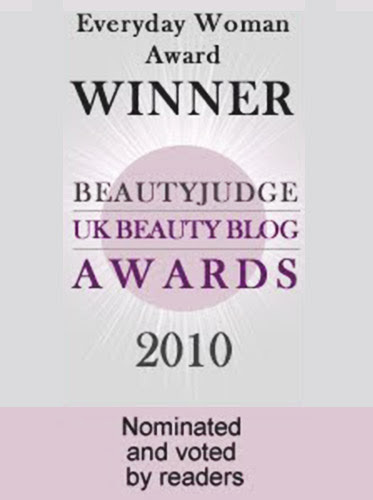 So, would I recommend the Albion Elegance Face Powder? I have to say, as with most luxury products, the main drawback is the price - the powder's 8.8g size costs S$125, while the bigger 27g size costs S$188. And while I like the formulation of the powder, with its nice touches like the use of Pearl Powder, ultimately, the effect is pretty subtle, so for some people, the subtletly of the effect might not warrant the high price of the product. 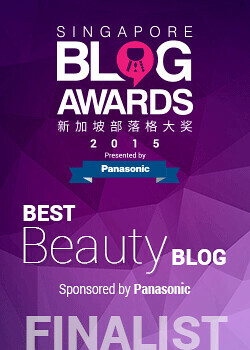 But, if luxury products are up your alley, if you like products with good, unique formulations, and if you like a nicely-done face powder with a subtle effect, then this might be worth checking out. The Bottom Line: Albion's Elegance Face Powder is every bit a luxury powder: expensive, but with a good formulation with some unique ingredients, and texture.